Environmental activists and locals in Kerala's Ernakulam region allege with evidence that the Pollution Control Board is entirely ineffective in preventing contamination of the Periyar river. M Suchitra reports. Ali Raj is one of the hundreds of fishermen rendered jobless due the heavy industrial pollution of the Periyar, the largest river in Kerala. The Eloor-Edayar region, about 20 km from where the river meets the Arabian Sea, is the industrial hub of Kochi, the commercial capital of Kerala and is home to Keralas largest industrial cluster, the Udyogamandal Industrial Estate. There are about 250 industries including the prominent ones like Fertilizers and Chemicals Travancore Ltd. (FACT), Hindustan Insecticides Ltd (HIL), Indian Rare Earths Ltd etc., mainly chemical ones, in this small area. They manufacture a range of chemicals--petrochemical products, pesticides, rare-earth elements, rubber processing chemicals, fertilisers, zinc/chrome products and leather products. Many of these industries are 50 years old and employ highly polluting technologies. The industries take large amounts of fresh water from the Periyar and in turn discharge concentrated toxic effluents after little treatment. This has led to large-scale destruction of fish in the river and has done extensive damage to the paddy fields and other farmlands in the region. Studies reveal that toxic pollution of the river has almost wiped out the traditional occupations including fishing and farming.  I used to get Rs 800-900 a day until some years ago. The catch has been reduced over the years. Now, I get only Rs 50 a day. How can a family of five live with this? asks 53-year-old fisherman Mahi, a resident of Eloor panchayat. Often massive fish kills occur in the river due to high concentration of pollutants. There are more than 30 unauthorised effluents pipes spewing toxins straight into the river from the industry. Air emissions range from acid mists to sulphur dioxide , hydrogen Sulphide, Ammonia and Chlorine gas. Wells and ponds in the region are severely contaminated. We used to take water from the river for drinking, bathing and washing. But now we are scared even to touch that water. We all depend on the piped water supply for everything, says Radhika, a resident of the ward one in the panchayat. Eloor has been identified as one of the toxic hotspots in the world by Greenpeace, an international NGO campaigning against environmental destruction. A study conducted by Greenpeace on the occasion of the 15th anniversary of the Bhopal Tragedy revealed the extent to which the Periyar and the nearby water and soil resources in and around the industrial area have been contaminated, leading to increased incidence of deaths and diseases among the 30,000 people living in the area. The study Status of Human Health at Eloor Industrial Estate, Kerala, points out that in comparison to the less polluted Pindimana village on the banks of the same river in the same district, the chances that residents of Eloor Gram Panchayat will contract Cancer are 2.85 times higher. Children are 2.63 times at higher risk of malformation due to congenital and Chromosomal aberrations. Chances that children may die due to birth defects have increased 3.8 times higher. Death due to Bronchitis at Eloor is up by 3.4 times. Deaths due to Asthma are up by 2.2 times. The study points out The Hindustan Insecticides Limited (HIL), a Government of India enterprise, has been manufacturing pesticides including DDT and Endosulfan (both banned) at its Eloor plant since 1956. The plant located adjacent to a wetland apparently discharges its effluents to an open creek .The water samples from this creek contained more than 100 organic compounds, 39 of which were organochlorines, including DDT and its metabolites, endosulfan and several isomers of hexa chloro cyclo hexane (HCH). DDT and its metabolites were also detectable in the wetlands surrounding the industrial estate. Persistent Organic Pollutants like DDT and related compounds are of particular environmental concern because not only are they toxic but they are also highly resistant to degradation and are liable to bioaccumulate, points out Sanjiv Gopal, Toxic Campaigner, Greenpeace India. DDT is the most notorious of the 12 chlorinated chemicals identified for total elimination by the Stockholm Convention. HIL is one of the few remaining DDT producing factories in the world. Sediments collected from HIL site, also contained high levels of heavy metals like cadmium, chromium,. copper, mercury and zinc. We are watching our river die. Were all like the prople waiting pensively by the death-bed of a loved one. The state, which has all the powers to save the river is indifferent. People have lost faith in the system, says V J Jose, the Periyar River Keeper appointed by Greenpeace India to monitor the quality of water in the Periyar. 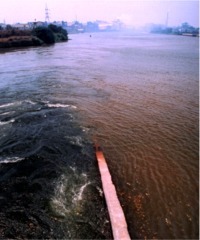 While the environmental activists in Eloor allege that the State Pollution Control Board is entirely ineffective in controlling pollution if not preventing it, the Board claims that it has been taking actions against pollution since its inception in 1974, and now majority of the companies adhere to environmental standards on effluents discharge. The Board officials point out that around 70 cases have been lodged against different factories in the last two decades. The Board has succeeded in making most of the factories install effluents treatment plants, says Paul Thachil, chairman, KSPCB. The river is more polluted by sewage more than the effluents from the industry. He also says the regional office of KSPCB in Kochi has been authorised to regularly monitor the water quality of the river near the industrial estate. The Comptroller And Auditor Generals Report (for the year ended 31 March 2000) on the performance of the Kerala State Pollution Control Board (KSPCB) strongly condemns the Board for not taking proper actions to prevent the pollution. The report highlights that enforcement of statutory provisions of the Acts/Rules for protection of environment, control of pollution and improvement of water quality, had been ineffective due to several factors like PCBs reluctance to invoke the legal provisions of the Acts, lack of monitoring and supervision, failure to conduct comprehensive surveys of polluting units in the state, absence of co-ordination between the Board and the licence granting authorities (panchayats) and lack of adequate manpower and laboratory facilities. The report points out the failure of the PCB to conduct comprehensive survey of industries in the state. The PCB has to give a letter of consent to each industry, fixing the technical parameters and the quantity of water it can take and discharge for pollution control. But out of a total number of 2.17 lakh industries registered, the PCB has identified only 2250 as highly polluting units and issued letters of consent (official permission) to 1383 units (61 per cent). The others function without permission. The report also notes a huge shortfall in inspection of industrial units for monitoring effluent standards, also observing that the PCB failed to take effective follow-up action even in cases of complaints received from people regarding discharge of untreated effluents, contamination of groundwater etc. The PCB has ignored its own test results of water samples taken from the Periyar following two massive episodes of fish deaths in July 1998. Analysis of water samples by the PCB from 12 points in the river found concentration of ammoniacal nitrogen at 12 to 24 mg/litre as against permissible limit of zero. The industries and the panchayat proposed dredging the sludge and dumping it in a nearby wetland. The people rejected the on the grounds that it would permanently impact the water table. In 2001 people took direct action against the industries by blocking a stream into which effluents are dumped. The companies have ever since been forced to enter into a dialogue with the panchayat and the people to come up with a plan to clean up the toxic mess along the stream. But they have failed to come up with a safe and effective plan for doing so. The plan proposed by the industries and the panchayat involves dredging the sludge and dumping it in a nearby wetland. The people rejected the proposed toxic dumping plan of the panchayat as it would permanently destroy the water table. It seems the government is finding it difficult to act on some of the important recommendations by Grrenpeace and the Periyar Malineekarana Virudha Samithy on the basis of scientific studies. The PCB had ruled out recommendation for zero discharge into the river. We have never demanded closure of the factories. What we want is clean production at Eloor-Edayar and compensation/medical rehabilitation of of all the people affected . An environment impact assessment study has to be done immediately and a chemical disaster management plan for Ernakulam district should be formulated urgently. Says Purushan.